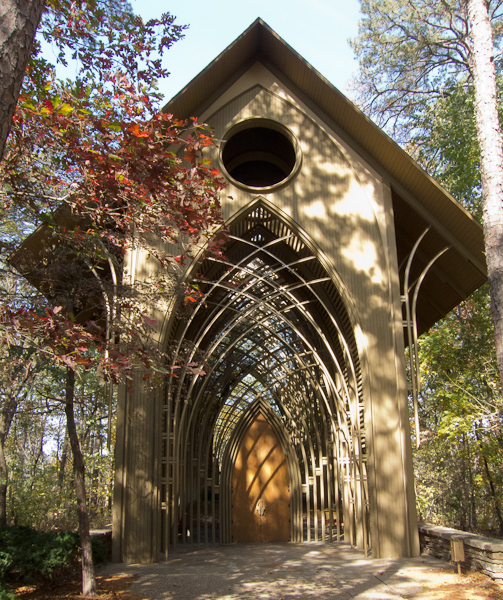 The Mildred B. Cooper Memorial Chapel, designed by architect Fay Jones, sits on a wooded ridge near a lake in Northwest Arkansas. More photos from our visit to Arkansas are on Flickr: Joy’s Photostream. These photos are for Saturday Snapshot, hosted by Alyce of At Home with Books. Check her post today for more photos around the web. What a beautiful chapel! I love the arcs that seemingly go on forever. Thanks for sharing. How beautiful. The soaring arches give such a dimension – sublime! And in such a superb setting. Mildred Cooper was the wife of a residential developer in Arkansas. 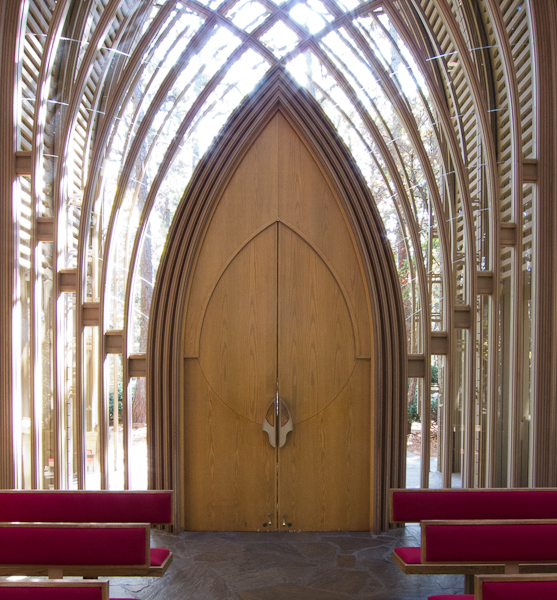 This chapel was built in the 1980s. That is gorgeous! I love the layered arches–it gives it such an interestingly beautiful look. That is so beautiful. Thank you for sharing it — how glorious! I love those arches! How beautiful. Wow – those arches are truly beautiful. The light and shadows add such a sense of peacefulness. Lovely photos. Wow, that’s an attractive little chapel. I love mitred doors, and this one is particularly beautiful with the mitred arches above. I haven’t seen anything quite like that before. Oh wow – that’s exquisite! Love all the glass and love the way it lets the beautiful, natural setting outdoors seem to join inside. What a stunning building, and equally marvelous photography. It is so inviting and bright.